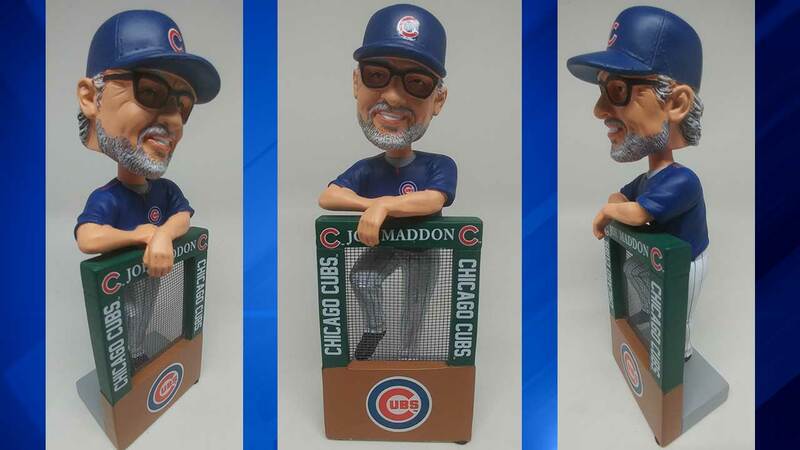 A limited edition bobblehead of Chicago Cubs manager Joe Maddon was unveiled Tuesday. The eight-inch-tall bobblehead, which depicts Maddon leaning against a dugout fence, costs $40 each. Only 360 bobbleheads are available for sale exclusively on the National Bobblehead Hall of Fame and Museum's website. Maddon managed the Cubs to the team's first World Series title in 108 years, beating the Cleveland Indians in Game 7 of the 2016 World Series. On Tuesday, he will manage the National League in the 88th Major League Baseball All-Star Game in Miami. On May 16, Maddon had his 1,000th win as manager when the Cubs beat the Reds 9-5. "With all of Joe Maddon's recent accomplishments, we thought that it was time for a unique bobblehead," said Phil Sklar, co-founder and CEO of the National Bobblehead Hall of Fame and Museum. "We're confident Cubs fans across the country will really like this new Joe Maddon bobblehead." The bobbleheads were produced exclusively for the National Bobblehead Hall of Fame and Museum by Forever Collectibles and are officially licensed.